Avascular Necrosis (AVN) is a condition which is typically marked by the death of bone tissue because of lack of blood supply to it. This condition is known by some other names also, including Aseptic Necrosis, Ischemic Bone Necrosis, or Osteonecrosis. Avascular Necrosis occurs due to loss of blood supply to the bone, thereby causing the bone to die. Since bones are living tissues which need blood, any interruption to the blood supply to the bones can lead to bone/joint trauma or severe bone damage. Delays in treating the condition can even result in the collapsing of the bone. Avascular Necrosis commonly affects people aged between 30 and 60 years. The most common site of the occurrence of this condition is the hip. Besides the hip, the condition can also affect the knees, the ankles, and the shoulders. In some people, Avascular Necrosis may develop bilaterally (that is, on both sides), like in both the hips or in both the knees. Avascular Necrosis causes excruciating pain to the sufferers as it progresses, although it does not have any typical symptoms in its early stages. The symptoms of the condition first start becoming obvious when the sufferers start experiencing pain while putting pressure on the affected bone. Gradually, over a period of a few months, the pain becomes more constant; and the progression of the condition may eventually cause the affected bone and the nearby joint to collapse. This may increase the severity of the pain, making it difficult for the sufferers to use the affected joint. 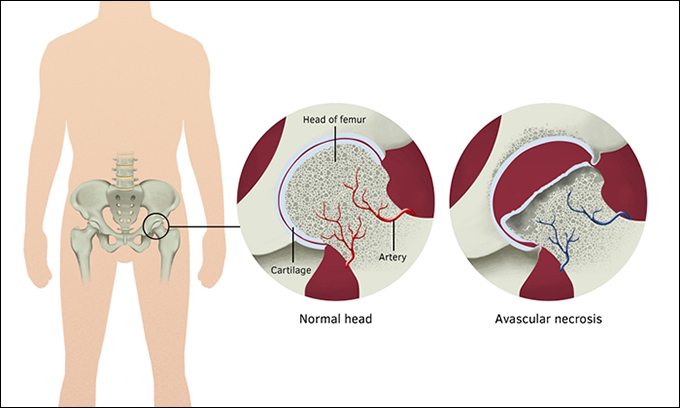 Some of the common reasons for the occurrence of Avascular Necrosis are: long-term use of steroids or inflammation-fighting drugs, drinking alcohol in excess, dislocation/fracture of the thigh bone, fatty deposits in blood vessels, inflammation, blood clots, and damage to the arteries. Any kind of injury -- for example, a dislocated joint -- might cause damage to the surrounding blood vessels. People suffering from Avascular Necrosis may require treatment when the affected joint starts paining when they put weight on it or when they lie down. The common treatments of the condition generally include the use of medications, physiotherapy, or surgery. Pure and standardized extracts of the 'Gotukola' herb (Centella asiatica) are used for the preparation of these capsules, which are very effective in promoting overall health of the body. The Gotukola herb is widely used in Ayurvedic medicines because of its proven medicinal value. The herb is rich in nutrients as well as in Vitamins A, B, E, and K.
The use of Gotukola capsules is beneficial for patients suffering from Avascular Necrosis because the capsules are useful in supporting healthy blood circulation in the body, enhancing brain health, improving memory and concentration, ensuring healthy metabolism, preventing nervous exhaustion, and balancing the body's Vata, Pitta and Kapha doshas. Dosage: 1 capsule, twice a day. The herbal components of these capsules have immense significance in Ayurveda, particularly in disorders associate with bone health. The herbs from which these capsules are prepared include: Shudh laksha (Laccifer lacca), Hadjod (Cissus quadrangular), Arjun (Terminalia arjuna), Suhanjana beej (Moringa oliefera), Praval pisti (Corallium rubrum), and Mukta (Compound of Pearl Calcium). Bone Support capsules are recommended for Avascular Necrosis patients because the capsules have the ability to strengthen the bones, improve calcium metabolism, pacify toxins in bone tissues and nervous tissues, maintain bone health, retain bone density, provide bone deposition, enhance immunity, help in low bone density, treat bone loss, and balance the ‘Pitta’ and ‘Kapha’ doshas of the body. Dosage: 2 capsules with plain water, two times a day, after meals. For preparing these capsules, two potent anti-inflammatory herbal ingredients are combined. These two ingredients are --- the ‘Shallaki’ herb (Boswellia serrata) which has the capability to manage inflammation; and Curcumin (Curcuma longa) which is an excellent antioxidant. Patients suffering from Avascular Necrosis can benefit from the use of these capsules because they can comprehensively support the immune system, increase blood supply to joint tissue, keep the joints healthy, improve the biochemical structure of cartilage, and maintain a healthy cardiovascular system. These capsules are prepared from pure extract of ‘Ashwagandha’ herb (Withania somnifera), which is widely known for its anti-inflammatory properties. The herb can have an extremely beneficial effect on the overall health of a person. Ashwagandha capsules are useful for Avascular Necrosis patients because of their ability to boost to the immune system, eliminate toxins from the body, enhance physical and mental capabilities, maintain heart health, and pacify the body’s Vata and Pitta doshas. Dosage: 1 capsule with plain water, two times a day, after meals. For the preparation of these capsules, standardized extract of the ‘Guggul’ (Commiphora mukul) is used. The herbal extract is considered to be a ‘Rasayan’ by Ayurveda practitioners because it can effectively promote youthfulness and longevity. The use of Guggul capsules is beneficial for strengthening the bones, providing relief from any kind of pain, lowering high cholesterol levels, supporting the nervous system, regularizing the body’s fat metabolism, cleansing the arteries, treating obesity-related disorders, and managing degenerative/inflammatory conditions. Dosage: 1 capsule, two times a day. 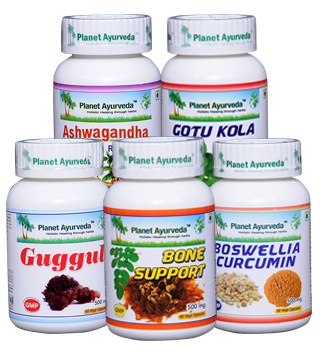 Planet Ayurveda's herbal products for managing Avascular Necrosis are 100% natural and vegetarian products. The use of these herbal products is very beneficial in maintaining healthy bones, and ensuring the overall health of the skeletal system. These products are prepared from pure herbs; and do not contain chemicals, starch, colors, yeast, binders, additives, fillers or preservatives. Hello m suffering from avn in left hip 10% avn seen . I HV lupus nephritis class iv . So I got avn can help me to come out from lupus nephritis nd van also.. i hv also done surgery hip replacement in ri8 side.